Wahoo - a giveaway I hear you cry! Well, this is one cool giveaway, if I say so myself. I have 3 items from Lashes of London to send to one lucky person. I recently won a facebook competition run by Lashes to win £200 of vouchers! How lucky was I! Like a pro, I splurged the lot and have some fantastic new additions to my wardrobe now. However, I wanted to treat you guys to something too. It's been a while since my last giveaway! So I chose this Bound Blue Lace top originally to giveaway (I've got one too!). But I bought a load of size 10 stuff to try on and I ended up with a couple of things that didn't fit me. Inevitable when ordering online, eh! The two new spring / summer collection releases here, the Trixie Lilac PU skirt and Harlot Cut Out Bralet top were (fortunately for you lot!) these two things! So, up for grabs I have these two gorgeous tops and a rather spectacular skirt in size 10. These will all go to one lucky winner! I want to apologise for only giving away one size - my prizes were non exchangeable so I couldn't get a wider variety of sizes. But these things may fit you if you're an 8, 10 or 12. Even if you're not, you can do what you like with it... sell it, give it to a mate, whatever you like! The only conditions are that you're a GFC follower (had issues with tracking followers on other platforms last time :\!) and have a UK address (sorry - I'm a bit strapped for cash at the minute so can't offer worldwide postage!). There are other optional entries too! Watch the video to see the garbs and for a bit more info! Good luck my fab little readers! That top is gorgeous, I've been lusting after it for a couple of weeks now xo. My lashes items were a mix - I got a few things that were tight and a few that were loose hah! 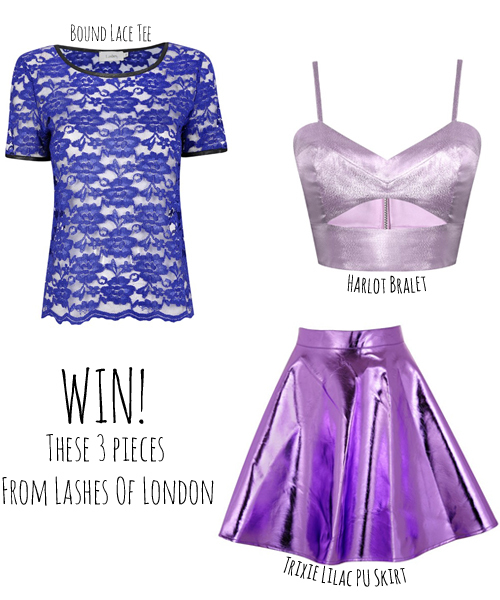 I have the lace top, I love it, great giveaway! I tried to add my GFC name and ended up adding random letters by accident my GFC name is sophie pocock. Great giveaway hope I win!.